RYAN: It’t number three in what is now going to be at least a four movie franchise. Paramount has already announced a fourth Star Trek film in which Chris Hemsworth will return as Kirk’s father. I didn’t even remember him in it. MIKE: It’s easy to forget because he had very short screen time in the first movie. 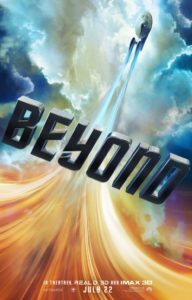 RYAN: By the way, I’m glad Mike Zummo joins me for this review – as not only an avid Trekkie, but also as a sci fi author. You always get a lot more out of these movies as a fanboy. But back to Hemsworth, I wish they hadn’t just announced that because it made me think about him during the movie, which was a bit distracting. I like this franchise. You certainly notice it’s a different director this time. JJ Abrams still serves as Exec Producer but it really has a different feel and tone. But what I really like about Star Trek is how accessible it is. It’s as sci fi as it gets – with the ships, intergalactic – but it feels very much like, if we, as a species, had to leave the earth and flashed several hundred years into the future, this could be us. You can actually identify with these characters. Because of that, I prefer it to Star Wars. MIKE: That’s very true. And I can understand you feeling that way. RYAN: And especially in this installment, there’s Yorktown, which is like a futuristic version of a metropolitan New York City. Looking at that location was incredible. I wanted to go there. It’s one of my favorite parts of the movie, very Tomorrowland, like a Disney attraction. MIKE: And it’s not just a city of the future, but it’s populated by all alien races. RYAN: And without getting political or giving away any spoilers, there is a theme here that is very timely considering recent event in the real world. And I loved that. This film is wholeheartedly entertaining. I was beyond impressed by some of the shots and cinematography here. I was in awe of it. MIKE: It is very visually different from the first two. This is directed by Justin Lin. JJ used more dramatic lighting, lens flares, things like that. Instead this film goes for more realism. It’s a great style. This movie also paid a lot of homage to previous films – from the originals to the recent ones. They’re playing off of nostalgia, not only with some of the story but also visually a bit. That feeds the original audience while bringing in the new. RYAN: But those of you who recognize those things, must really get a kick out of it. MIKE: This movie felt like a long episode of the original series, in a good way. This movie is a return to that sensibility, dealing with a political issue or something; whereas the first two films in this franchise more set up the Klingon war which was just not even mentioned in this movie. It’s very epic in scope but the story seemed more intimate. RYAN: Well that was allowed for by the fact this film sets the group apart for much of it – the team breaks off into twosomes before coming back together. But you’re right, focusing on two characters at a time allows their relationships to deepen and explore the story in a different way. It didn’t feel episodic to me – it was a very cohesive movie with a great flow. MIKE: The first two movies were more like action packed roller coasters and this one had a much more different pace. RYAN: I love this cast. I love the new character, Jaylah. Played by Sofia Boutella, an Algerian actress, whom I loved in Kingsman: The Secret Service. She’s a really nice, new addition here. I wish there had been more Anton Yeltchin. It’s just so heartbreaking seeing him, knowing he’s gone now. The film is dedicated to Leonard Nimoy and For Anton – both very touching at the end credits. By the way, the villain in this movie is Krall – Idris Elba. He’s pretty evil and scary in this. He has some dark moments and I’d say he may appear as scary as even the Wicked Witch of the West, might be a good idea to heed the PG-13 rating here for younger kids. MIKE: Yeah he was intense, a lot of violence and intense moments. RYAN: But I mean just visually I think Krall looks intimidating and freaky. Would he be too much for your son? MIKE: I think my son would be ok. He’s good at separating reality from fiction. What I liked so much about the message from Krall was his political message and there’s a really great moral to the story here about humanity and what could happen to us. Also, this is the first time we saw Sulu with his spouse and daughter. RYAN: It is done in the most mild way possible, but I still overheard a rude, homophobic comment about it when they were on screen which just made me think that is exactly why it’s important to portray a gay character in a mainstream movie franchise – it’s time people see how normal it is, to desensitize audiences. MIKE: But then there was the original actor, George Tekai, who said he and the original creator of Star Trek wouldn’t approve of it, back in the 60s. But we’ve come a long way since then. RYAN: And with all due respect to George, who is intimately associate with the character and this series, the issue is bigger than his opinion. And if he had been in my seat during the press screening, and heard the hurtful, homophobic remark I heard, he might change his mind and see the importance of this moment. RYAN: The action was so phenomenal at times, I was squirming in my seat a bit, like as if I moved, I could help the ship move or something. MIKE: And we saw it in 3D which really intensified the experience. RYAN: I love 3D – I haven’t seen one in a while and it was cool. MIKE: The credits were great for the 3D, like you’re on a roller coaster. And the story is good – it’s not predictable at all. RYAN: This is definitely one to see in the theater and benefit from the surround sound, large screen, all of it.